The Canterbury Brewers Decorator Centre has been supplying tradespeople and local residents with paint and wallpaper for more than half a century. 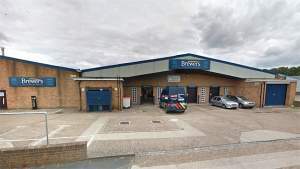 Our large premises on Maynard Road carries an impressive range of stock, from trade paints in bulk through to designer paints, as well as an extensive choice of wallpaper pattern books and decorating tools and accessories. Our trade customers often book a site visit to get specialist product advice on challenging decorating decisions. And if there’s a product you’re after that we don’t have in-store, we can usually lay our hands on it within a day or two. We deliver throughout the local area. With such a good selection of products, you don’t want to feel rushed to reach a decision. So there’s lots of unrestricted parking outside and we’ve set up a kids’ area to keep your children happy while you make those important decisions. You’ll find us off Wincheap; turn onto Cow Lane and then onto Maynard Road.